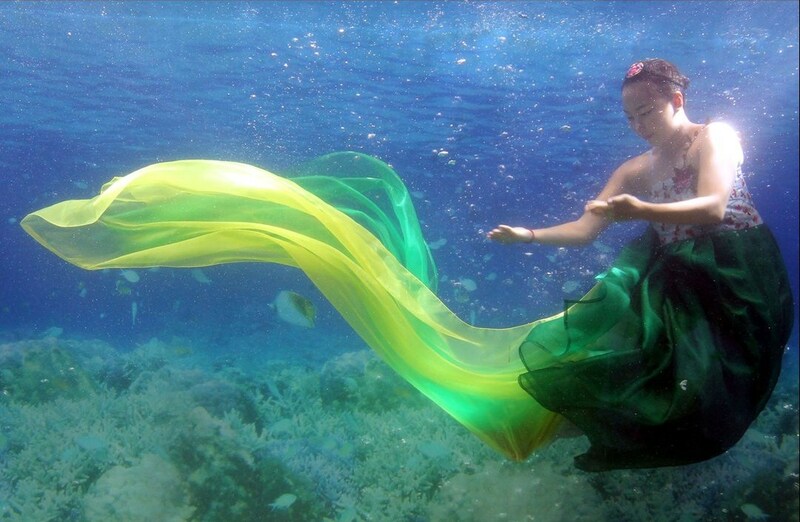 I say the next underwater show should definitely feature pearls! One should not forget where our favorite gems are coming from. For more pictures from the show, click here and here. The World went crazy about famous pearls these days! 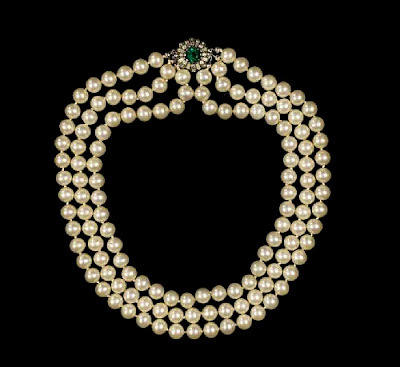 Two strands of Jacqueline Kennedy's faux pearls and a pair of her simulated pearl and diamond ear-clips went up for auction this Monday, just two months after the London's exposition of MM's famous pearl choker. We all saw the "Girl with a Pearl Earring" by Johannes Vermeer, but did you know that this is not the only canvas by Vermeer that introduces pearls as the object of fascination? In fact, there are many other paintings from the Master that incorporate pearls into the scene: Woman with a Pearl Necklace, Woman with a Lute, The Concert, A Lady Writing, Girl with a Red Hat, A Study of a Young Woman, A Portrait of A Young Woman, Mistress and Her Maid, or Lady Writing a Letter with Her Maid, just to name few. The Woman with a Pearl Necklace has its main focus on pearls. 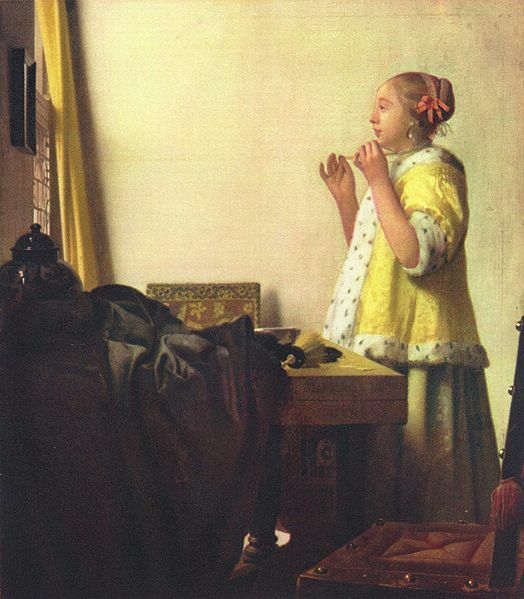 A young noble woman is standing next to the window, but it is not the exterior world that occupies her mind. She looks into a small mirror on the wall and admires herself wearing a strand of pearls. She gently ties two yellow ribbons attached to her necklace, a movement that reflects her innocent self-satisfaction. The daylight is softly sparkling up her pearls, giving the girl even more pleasure from looking at them. Her mind seems to be lost in contempt as she admires her appearance enhanced by the beauty of pearls. She feels complete and true to herself. 350 years later and we still feel the same about our necklaces, don't we? The summer might be almost over, but our summer moods keep on feeding our style cravings. This year's hit frocks, shorts and denim, are a great match in a city setting. Especially if they come together complemented with the new fling of street fashion - the Oxford shoes. Finally something for those who love strolling across the town without risking an ankle sprain because of the 6-inch heels! Bold color juxtapositions and over-the-top necklaces spare us the boredom of looking as our younger brothers. I am throwing in some golden pearl studs for style statement and a purse belt for convenience. It has been already for several seasons that designers all over the world encourage us to pile up our favorite jewelry pieces: pendants, necklaces, rings, or bracelets. The more, the better, the more colors and shapes, the better. Beware, it's very easy to go overboard with a style like this! Personally, I would not try to follow styles presented in fashion magazines to the letter. Everyday wearing of 20 cocktail rings and 15 statement bracelets in one go is not particularly practical or comfortable. I am more of Coco Chanel's adept: before going out, one should remove one piece of jewelry. My advice is to bet on one type of jewelry: if you stack rings, forget the bracelets. If you pile up necklaces, make them the focal point of your outfit and skip the rings. But above all: have fun! Email us at style@love-my-pearls.com with questions on how to match pearls with different fashion styles. Check back our blog posts for our expert style advice! 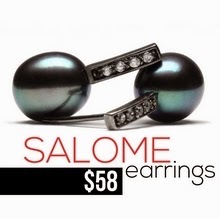 From pearl jewels, accessories, and frocks, to celebrity styles and fashion trends, we've got you covered. 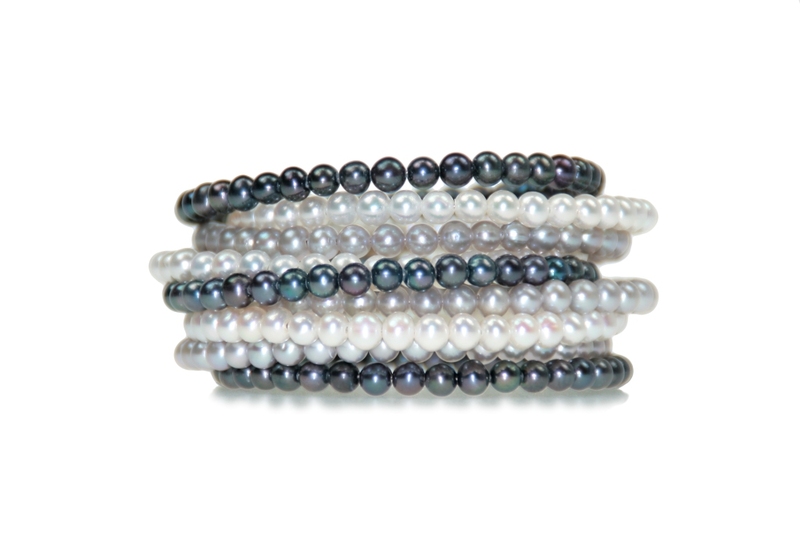 What is your favourite pearl colour? © 2012 Love My Pearls Ltd. Theme images by merrymoonmary. Powered by Blogger.